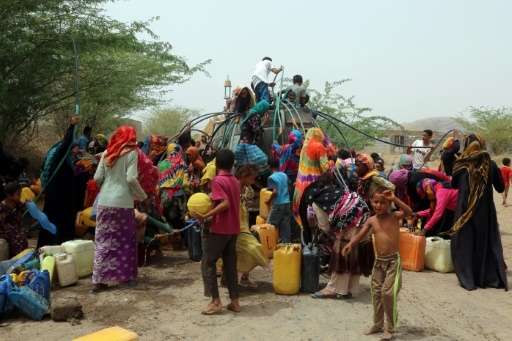 Aden (AFP) – A Yemen government offensive backed by ground troops and warplanes of the Saudi-led coalition has displaced tens of thousands of people along the country’s western coast, Amnesty International said Thursday. The rights group warned “the worst could be yet to come” after surveying civilians who made the perilous escape from front line towns south of Hodeida port, the focus of the offensive. Saudi Arabia launched a coalition in Yemen on the side of the internationally recognised government in 2015, with the goal of rolling back the Iran-allied Huthi rebels. The government offensive, backed by air power and ground troops, has been moving north along the Red Sea coast with the goal of seizing rebel-held Hodeida — the country’s largest port. The United Nations says the offensive has displaced more than 100,000 people in the past six months, sending them fleeing to Aden and other government-controlled areas in the south of the country. The journey is a costly one amid wartime inflation, to the point that many are staying behind under bombardment, Amnesty said in its report. “The vast majority of those Amnesty International spoke to said they could only fund the trip by selling precious belongings, such as wedding rings, property deeds and livestock. “They paid to leave on private buses and trucks, forking out an average of 10,000 riyals (around $30 under the conversion rate used in Huthi-controlled territories) per person, a small fortune in the local economy, where the clashes had forced many to stop working,” it said. Millions of Yemenis are living on the edge of famine in what the United Nations calls the world’s gravest humanitarian disaster. The escape from rebel-held coastal areas to government territory is also a dangerous undertaking, with buses carrying civilians at risk of hitting landmines and other explosive devices “planted by the Huthis in a bid to prevent government forces from advancing”, Amnesty said. One woman said she fled during fierce clashes, and while she managed to bring her infant and toddler daughters, she left behind her mother and seven-year-old son in the chaos. “We left not thinking we would survive,” she said. Nearly 10,000 people have died in the Yemen conflict since the coalition intervened on behalf of the government three years ago. More than 2,000 others have died of cholera. Feature photo: AFP/File / ABDO HYDER. The United Nations says the offensive has displaced more than 100,000 people in the past six months, sending them fleeing to Aden and other government-controlled areas in the south of the country.